Andrew York, one of my favorite living guitarists and composers, and former member of the Los Angeles Guitar Quartet, played in Austin last night (22 June 2013). He gave us a great show of pieces by himself and some selections from Bach’s fifth cello suite. The Bach was in cello tuning, which was a revelation to me—a much lower pitch than the versions normally heard on guitar. Normally at classical guitar concerts I try to shoot as discreetly as possible (and as discretely as possible, not being very good at multiple exposures), releasing the shutter only during loud passages or during applause. But this was the first Austin Classical Guitar Society show to take place at GT Austin (the Church of Glad Tidings) and I wanted to capture something out of the ordinary to mark the occasion. My guest at the show (sitting with legs crossed at bottom left) told me that while I was shooting “I was getting looks” from someone in the crowd. Thankfully, that guy is not looking at me in the final picture . . .
Tech specs: 15 images (5 wide by 3 high) + 1 at a different exposure for the performer. Performer: ISO 3200, f/8, 1/60th. Crowd: ISO 3200, f/8, 1/5th. Then in post I upped the exposure on the crowd by another full stop. 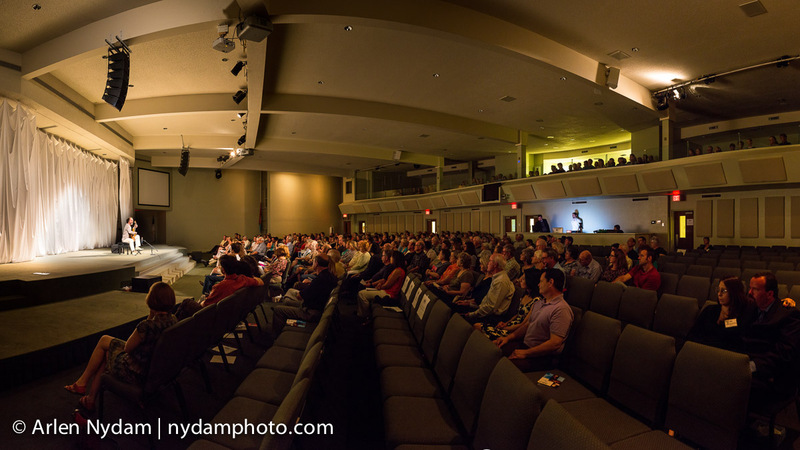 With a panorama full of people, even seated people, some of whom may even be sleeping, I don’t like to use too long of shutter times. Plus, as I was reminded after my first shot, on the 5D Mark III the “silent shutter” mode is negated when one uses the 2-second timer. So in the dark, my face red from mirror-slap embarrassment, I silently turned off the timer, and did my best to hand-press the shutter for each of the required exposures. The results turned out to be perfectly acceptable, in this case, but touching the camera during a 1/5th-second exposure could easily result in unwanted blur. Also moved the camera 30º laterally instead of my normal 25º, in hopes of getting this semi-obnoxious business over with more quickly. (If only I had a sound-proof box to shoot from . . . or a mirrorless camera.) I think it saved me perhaps 3 frames . . . Still pondering the blending on the final image—I am not sure about the way the white curtain looks directly behind Andrew York. Thinking it should be brighter.